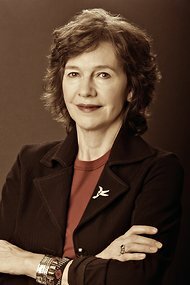 By Leslie Kaufman Beating out an unusually competitive field, Louise Erdrich won the National Book Award for fiction on Wednesday night for “The Round House,” a novel about a teenage boy’s effort to investigate an attack on his mother on a North Dakota reservation, and his struggle to come to terms with the violence in their culture. By Mary Beth KeaneMary Beth Keane: Congratulations on being named a Fiction Finalist for the 2012 National Book Award. I know this must be a busy time for you, so many thanks in advance for doing this. How’d you learn you’d been named a Finalist and what was your first response? Louise Erdrich: I am on a book tour and was just leaving Nashville, where I'd been at Ann Patchett's wonderful Parnassus Books. Jane Beirn, my publicist at HarperCollins, called me. I have worked with Jane since Love Medicine in 1984, so I know every nuance of her phone voice. I immediately knew this was something really, really good. The first call I made was to my parents. It was early in the morning but I knew they'd be awake. MBK: Where did you begin The Round House? What was the seed idea? LE: The immense difficulty of prosecuting crimes of sexual violence on reservations has haunted me for many years, but I didn't know how to tell the story. I wanted to write it as a suspense novel. How else to include jurisdictional complexity? I didn't want to bore myself. When my main character, Joe, started talking, I knew I had been waiting for him. A writer's gift. Even now I miss writing in his voice and miss working on this book.Comment: For more on Louise Erdrich, see Louise Erdrich's Birchbark Books and Alexie and Erdrich Deserve Nobel Prizes.